For the last couple of years, some of you may have noticed that the paper we have been using has only ten percent postconsumer waste. For some strange reason, the paper mills here in the US are not making a high postconsumer coated paper. The mills say there's no demand. Well, I've been demanding, but to no avail. I've found a 50% postconsumer, elemental chlorine free/totally chlorine free (ECF/TCF) paper, made by Stora, a German paper company. We have not tried paper from overseas before because of the high embodied energy involved in bringing it from Europe. Stora is committed to minimizing the effects of transporting raw materials and finished products. They are developing ways to use residues from their mills to fuel the boilers of steamships. "The ideal situation would be to use waste paper that is not suitable for recycling," says Olle Widigsson, Technical Director of Purchasing and Transport at Stora. "That way we would do away with the energy demanding and round-about method of making ethanol from biopulp, for instance." Also, Stora's Transport Environmental Programme (STEP) goal is to cut present consumption of electricity and fuel by more than half. The same applies to nitrogen oxide and sulphur emissions. Here in the USA, appearance is very important. We're still amazed at the increase in newsstand sales after we switched to a glossy paper. The content is the same, but because the appearance is professional, folks are more inclined to give us a look. HP69 is the test run issue for the new paper from Stora. This paper has a matte or calendered finish—favored in the European community. This finish is easier on the eyes but we are concerned that the dot gain (ink spreading in the paper fibers) will be increased. In other words, the photos and color ads may look a little different. Remember—I'm writing this before we've seen an issue printed on this paper. So far, we've just seen printed samples from the mill. Enough of the unknown—here are some impressive facts. Stora manufactures this paper in Odense, Denmark. This coated two sided matte paper is called RePrint Web, and comes in a sixty pound base weight. It's made with 50% postconsumer recycled de-inked fibers and 50% TCF pulp. The mill tries to purchase chlorine-free postconsumer waste, but it's not always possible. We purchased this stock through Andrew McLaughlin at Woodland Paper. Andrew has been very helpful and responsive. These folks sell a wide variety of paper, from office paper to the really big rolls for web press use. This paper is slightly cheaper than the type we've been using. If all goes well, this is the paper for us. BGA Standard: German Federal Board of Health certification for food contact and the European Standard for Safety of Toys. BGA is the German equivalent to the United States Food and Drug Administration. EMAS: The Eco Management and Audit Scheme is a European program which sets guidelines for manufacturing companies. These guidelines introduce environmental management as well as systematic control and reduction of the company's overall environmental impact. Nordic Swan: To be awarded the Nordic Swan Environmental Label, a company must undertake to keep emissions to air and water below strict levels. The chemicals and the production processes are also closely monitored as part of the Nordic Swan standard. EUGROPA: The European paper wholesalers symbol for recycled paper containing at least 50% genuine recycled paper. Aging Resistance: According to DIN 6378-LDK12-80, RePrint will retain its strength properties for at least 100 years. The Deutsche Industry Norm registration is a very specific standard for European business operations and details exact properties and testing outcomes. On 17 December 1998, Oregon renewable energy activists journeyed to Portland to meet with some of Oregon's biggest utilities. The topic of discussion was our proposed Oregon Net Metering Bill for grid-connected RE systems. The purpose of this preliminary round of meetings was to introduce our net metering bill to the utilities and to answer any questions they might have had about this bill. Peter G. West, Senior Policy Analyst for the Renewable Northwest Project, and Tom Starrs, lawyer for the group and author of most of this nation's net metering bills, attended the meetings. David Parker, Joe Schwartz, and Richard Perez represented the Oregon Solar Energy Industries Association (OSEIA). Our first meeting was with PacifiCorp, known in the energy biz as Pacific Power. We met with Terry Flores, Senior Government Affairs Representative; Bill Edmonds, Environmental Policy Manager of Government Affairs; and Corey Cook, Contract Administrator of Retail Sales and Distribution. Our second meeting was with Portland General Electric (PGE). There we met with John McLain; Wayne Lei, Director of Environmental Affairs; Sara J. Cardwell, Manager of Tarrif Administration; and Cindy Finlayson, Legislative Relations. For our third meeting, we drove to Salem and met with both Salem Electric and the Eugene Water and Electric Board (EWEB). Attending for Salem Electric was Robert J. Speckman, General Manager; and Roger Kuhlman, Engineering and Operations Manager. Mathew W. Northway, Manager of Energy Management Services, represented EWEB. At all these meetings we discussed the energy, safety, economic, and environmental aspects of our proposed bill and how it might affect utilities in Oregon. Utility response varied from "Don't try to legislate our rates," to "Wow, if there were enough folks doing small-scale RE on-grid it could improve our power quality." We left PacifiCorp with a positive feeling that this utility might support the bill. I left PGE with the feeling that they would rather not see Oregonians making their own solar, wind, or microhydro power. The most favorable meeting was with Salem Electric and EWEB. These smaller utilities immediately grasped what we were trying to do, and wanted to help. Were these meetings fruitful? Only time will tell. In today's environment of utility deregulation, I found these mega-companies strangely uncertain about their futures. After a century of publicly granted monopoly, they are being forced to compete. Their customers can now choose where their power comes from. Our renewable energy bill further complicates the confusing array of choices. Their customers can now turn the tables on them and put RE onto their grid—a customer tonight can be a supplier tomorrow when the sun shines. Stay tuned to find out if Oregon's utilities are up to the challenges they will face in the next century. Meanwhile, the Proposed Oregon Net Metering Bill trucks on. We are now finding legislative sponsors for this bill. We will introduce it into this year's session of the Oregon Legislature. We are preparing for a public discussion of this bill and its benefits for Oregon and Oregonians. We've just begun! I've been amazed by the number of guerrilla solar systems out there. I'm also amazed at utility response to the solar guerrilla—to say that utilities don't like them would be a huge understatement. I'm interested in this energy/social phenomenon. Here's a deal for you solar guerrillas out there. Send us a description of your system, a short statement about why you are a solar guerrilla, and a photo of you and your PVs (be sure to wear a mask or put a bag over your head...)—we'll send you an ultracool Solar Guerrilla T-shirt for free! This T-shirt is a special run for solar guerrillas. You can't buy it—you have to earn it. Be sure to include a T-shirt size and shipping address with your message. All this correspondence will be held absolutely confidential. We want to profile Solar Guerrillas in each issue, so plan on being in print and in the utility's face. What fun! Hello Roger. Here is the drawing with the safety equipment to be inserted. Every hot or positive conductor should have overcurrent protection. For the low amperage conductors (under 100 amps), use circuit breakers, but for the positive battery cable use a 400 amp Class-T fuse. Also be sure to put a high-amperage DC-rated disconnect between that fuse and the battery The AC breaker panel should be grounded, with the generator and inverter boxes bonded to that ground as well. The shunt for the system metering goes on the negative battery lead. Connect all inputs and loads on the inverter/load/source side of the shunt so that it will monitor all current going into and out of the battery. I can't give up on the idea of building my own small wind generators. I would like to create my own small wind farm made up of the smallest micro-size wind generators available. The Thermax Corp. makes very small wind generators that are low rpm which, in my opinion, would be much better to use than trying to use small high rpm DC motors as generators. Is it possible to connect several small wind gennies together and run them to the batteries? If so, how would I do it? Do I need to put a diode in each genny's wiring to prevent back-feeding from other wind generators and the battery? Where would I place the diodes? David, the Thermax generators from Windstream Power Systems are a good place to start building your own micro wind farm. Check out their ad in this issue. They're pretty much the only game in town for small do-it-yourself wind genny kits. You may want to start with one of their kits, then expand from there. After you've seen their blades, take a shot at carving your own. The same goes for the tail and mainframe assemblies. After buying your first complete wind generator kit from Thermax, you may end up making all of your own parts, except the generators. Shop skills come in handy, as does a well-tooled shop to work in. 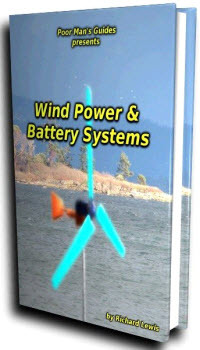 Yes, it's possible to hook several wind turbines to the same battery bank. The usual approach is to put the diodes in the positive wires going from the generators to the battery. The negative wires from the gennys are just connected to the negative battery terminal. 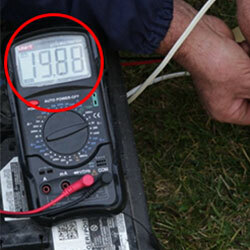 A voltmeter across the generator wires will tell you if a particular unit is charging. An ammeter on the wind genny side of each diode will tell you how much current each genny is contributing to the battery bank. Check out the Alternative Energy Engineering ad in this issue, they sell some inexpensive volt and amp meters. Slip rings transfer current down the tower through a set of brushes that ride against them. Let's say the slip rings are attached to the wind genny mainframe. In this case, wires from the generator itself are connected to the slip rings. The tower wires would be attached to the brushes that ride on the slip rings. The electrical connection from generator to tower wiring is made through the slip ring brushes. Seeing the Thermax kit will go a long way to understanding how they work. 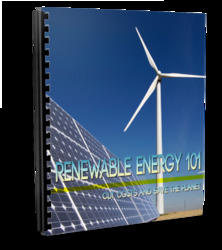 A great reference for building your own small wind genny is Hugh Piggott's book Windpower Workshop. While not a step-by-step cookbook, Hugh takes you through the steps required to brew your own, including carving your own blades. A more advanced project involves building your own generator out of an automobile brake drum. Check out HP65 for the book review and access information. The easiest way to contact Hugh is via e-mail ([email protected]). Hi Richard, I have been a great fan of Home Power for years and have all the back issues. Any thoughts on 24 vs. 12 volt systems? I want to design an off-grid PV and wind system for a small home in Wisconsin. I am ordering a Sun Frost RF12. The folks at Sun Frost want to know if we need a 12 or 24 volt model. I always thought that 12 volt was the standard; now I'm intrigued with 24. Any advantages? Hello Alan and Nancy, Go 24 VDC as a base system voltage for your battery. The loss in conductors (wiring) is inversely proportional to the square of the current flowing through the conductor. Remember, power in watts is equal to volts times amps. Doubling the voltage from 12 to 24 halves the current (amps), reducing the wiring loss by four times. With 24 VDC and higher voltages, PVs and wind gennies can be located further from the battery without buying large, expensive conductors. The same is true of conductors supplying appliances, such as the 24 VDC Sun Frost fridge/freezers. The weak point of all low voltage systems is in their mechanical/electrical connections. Going to 24 VDC means that you only have to move half the current for a given wattage, compared to a 12 VDC system. 24 VDC systems have fewer problems over time in their mechanical low voltage connections—on the battery, inverter, PVs, wind genny, charge controllers, and DC appliances. Dear Mr Perez, I inquired previously about a source for the electronic controller which you have as part of your Honda-powered 12 V car generator. I learned about it from your Solar2 CD-ROM. I still haven't found someone here who has the talent and believes from the schematic that it will work! Oh well, I have gathered up most of the parts for the generator and will be using a rheostat system by spring. In the meantime, I am thinking about replacing my batteries and wondered if you have any preference for battery type (lead-acid, NiCd, gel-cell) or capacity based on my setup. Lead-acid seemed to be the compromise selection based on the articles I have read from Solar2,but a few years have passed since they were written. I have probably not provided all the information, but based on the following, would you have the time to suggest a battery type and total amp hour storage for my system? My setup has been a 440 amp-hour, deep cycle battery bank (four 6 volt lead-acid golf-cart batteries) with a 75 amp battery charger. I just added the 75 amp charger, though I did have a 40 amp car battery charger. We probably draw a maximum of 40 amp-hours per day from it, most of the time at a 6 to 10 amp rate. I have a 1000 watt inverter which, after seven years, is still not hooked up although as I grow older it likely will be for TV, microwave, etc. The system is at my cabin, which sits under 60 to 80 foot tall maple and beech trees. The trees do just what we ask, cool us off during the summer. But at the same time they are not conducive to solar or wind power (as I understand it, even in winter, solar panels that have tree branch shadows on them do not work effectively). As I see it, my problems are two-fold. Since the cabin is in the Upper Peninsula of Michigan, below zero temperatures are not uncommon. Because it is a cabin, I can't be there all the time (sometimes two weekends in a row and sometimes it is four to six weeks between visits). So temperature and idle time are against me. In my generator room I have an insulated (R-20, sides and top) battery box which I have set in the ground at or below frost line, but it is not totally sealed from air since these are lead-acid batteries and I have read about the need for venting. I believe I have been successful at keeping the batteries from freezing most of the time. But lead-acid batteries do not consider 40 to 60° F ground temperatures to be optimum. Hello Danny, I'd suggest sticking with deep cycle, lead-acid batteries. There are no longer sources for affordable alkaline cells. I'd suggest at least four Trojan L-16s (700 AH at 12 VDC). A larger battery capacity would be better for your system with your cold climate. Richard, I am a new subscriber to HPand I also purchased the Solar2and Solar3 CD-ROMs. I have found lots of good information in them. I am trying to build the engine/generator from HP42 and have it almost completed. But there isn't any info on how to adjust the potentiometers and I don't want to goof it up now. NE555) to the amperage you want.When the battery voltage reaches the limit you desire, adjust the voltage pot down until the system regulates at that voltage. Dear Richard, In HP68 you discuss the merits of a DC alternator as a battery charging device. Years ago I put together the various components for an almost identical machine, except that I used the Electron Connection power control for the alternator field. This machine has worked perfectly for me. It seems to me that at that time you recommended charging lead-acid batteries at the C-20 rate. However, I don't remember noting the need for reducing that charge as the batteries approach full charge, although I realize that 117 VAC chargers perform this function automatically. Hello, Bob. If you have one of the old Mark VI field controllers that I made when I owned Electron Connection, then keep on using it. Unfortunately, neither the Mark VI or the later Mark 8.3 are commercial products anymore—they're just homebrew If you set the appropriate voltage limit on the Mark series controllers, then you don't have to worry about the current, as this system is voltage limited. To the Home Power crew, Perhaps you or some of your readers would give me advice in the areas of Hydrocaps, a Power Pulse battery maintenance system, and propellers. 1. I have used around 500 Hydrocaps and kept track of them individually by numbering them. Nearly all 146 Hydrocaps on my first large battery seemed to fail in the first six months. This was during winter, and before I installed a Whisper 600 on the system. As a result, I could not put an equalizing charge into the battery until spring. The battery building is not heated and temperatures got down to -10° F at times. I tried heating some of the Hydrocaps in the oven to dry them out as per instructions. I discovered that if I reinstalled the caps while they were still hot they seemed to stay warm with a 2 amp per cell charge on a full battery. But the next day after the battery was again full, a 2 amp per cell charge would not cause the caps to warm. I installed twelve new ones and they warmed quite a bit within 30 minutes. After several calls to the manufacturer, it was decided I should send some of the caps back for testing. The manufacturer returned them and said they all worked. They still did not warm under a 2 amp per cell charge on a full battery. I watched and recorded info for over a year and found the cells with caps that did not warm used more water than those that did warm. In all cases I can replace the cap that does not warm with a new one, and with a 2 amp per cell charge within 30 minutes the new cap is warm. It seems to me that I have a large percentage of caps that do not warm and do not make water, so I feel they do not work. Can you suggest anything that might help? 2. My Power Pulse is the 48 volt model. I had two weak 6 volt batteries in with six good ones. I let the pulse operate six months. In the two weak batteries, there were three cells that would not go above 1.220 to 1.230 specific gravity. I could not see any improvement in the group. I wasn't sure if the problem was sulfation so I put in a half ounce of EDTA solution in the three cells. Within a few days hydrometer readings increased about 5 points. I added an additional ounce for another 5 to 10 points. Another ounce yielded a modest increase in two of the three cells. One ounce more did not change the hydrometer readings. I have no questions about what I did, just reporting what I found. One thing that did bother me is when I called Abraham Solar Equipment about the Power Pulse, I received a different story than when I called to ask about ordering a unit. I wasn't offered anything I might try differently and also was told that sometimes it doesn't work. I installed the Power Pulse on a brand new set of 48 volt golf cart batteries and we will see what happens in a few years. 3. Now, on to a different subject—propellers. I have had experience with one old 12 volt 200 watt Wincharger, two Whisper 600s, and one Whisper 3000. My biggest problems are with propellers. It is my opinion that we are so demanding that manufacturers have become too concerned with getting every watt of power they can out of a unit by over-sizing propellers. And that, I feel, leads to problems during high wind (40 to 70 mph) conditions. You notice that most of my experience has been with Whispers by WPT. I can't say enough good about World Power Technologies. They are helpful and their warranty service is well above average. The two 600s operate well and with the new injection molded plastic props, maintenance and replacement should be greatly reduced. Most of my problems have been with the older model 3000, mounted on a 90 foot tower. It has self-destructed twice in high winds (60 to 70+ mph) while the unit was turned off. I expressed my feeling to World Power about too much prop. Although they did not agree with the shortening of the prop, they told me how to balance it if I did cut it off. I finally cut the props, but only 3 to 6 inches at a time. I wound up (no pun intended) cutting off a total of 19 inches for a diameter of about 11.5 feet. If my figures are correct, I have reduced the swept area from 163 to 95 square feet, as I figured that the center 1 2/3 feet had no effect. I do not have a wind speed indicator, but there is an automated weather station at a nearby airport that I listen to with my scanner. Hello, Michael. It sounds like you have toasted some of the Hydrocaps. They are catalytic converters and can be overdosed by more hydrogen and oxygen than they can recombine. Most Hydrocaps can only metabolize about two amps of overcharge current. Perhaps yours have had too much? I find it beneficial to remove the Hydrocaps during periods of battery overcharging, intended or otherwise, such as equalization. The electronic desulfators work best in lower voltage battery packs because there are fewer series connected cells. Electronic battery desulfators are primarily prophylactic and may or may not work on already heavily sulfated batteries. 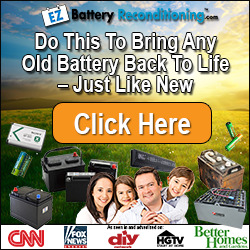 As you discovered, EDTA treatment is the last resort and often works where other methods of restoring lead-acid battery capacity have failed. I have recently acquired thirty used 12 volt batteries (about two years old). They were used in a UPS system and are Johnson Controls Dynasty UPS12-270 270 WPC (not sure what WPC means) batteries. They are sealed lead acid batteries and do not need venting. On the battery case, it states the float charge is 13.5-13.8 VDC at 77° F and 14.4-14.8 VDC at 77° F for an equalization charge. They are currently at full charge. I do not have any solar panels at this time, but I plan on a few in the next year. I want to keep these batteries charged. I was thinking of buying a charge controller for a solar array and somehow hooking it up to my grid power (with an AC to DC converter) to keep the batteries charged. I want to be able to reuse the charge controller with solar panels at a later time. Hello, Travis. Your idea will work. Just make sure that the AC to DC power supply (battery charger) is within the specs of the PV charge controller you use.